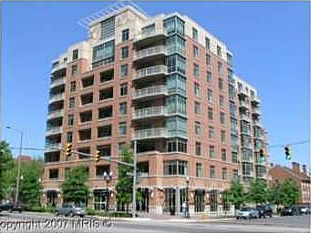 Here are photos of the Arlington, Virginia, condominium where Lawrence Yun lives. Lawrence Yun, as you recall, is the chief economist for the National Association of Realtors. He has repeatedly mislead the public by making overly-rosy housing market forecasts. His misleading forecasts are often quoted by the press and presented as coming from an authoritative source. Previously, I have posted a photo of Lawrence Yun's house in Centreville, Virginia, which he and his wife rent out. 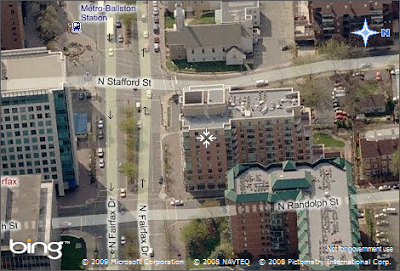 I have also posted a photo of the house of his predecessor, David Lereah. ...More money for extended unemployment benefits; more aid to the states so that they can maintain the most vital public services; and more money to expand mass transit, state college and university systems, efficient energy production and basic scientific research. 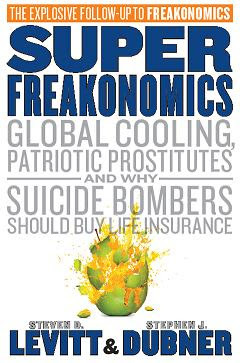 The economist Paul Krugman estimates that for every dollar in extra debt that will be required to finance this fiscal stimulus, about 40 cents will be repaid almost immediately in the form of tax revenues from higher short-term economic growth. And if the money is invested wisely in quality projects with high returns, the other 60 cents could wind up being a boon to future generations, rather than a burden. What would surely not be good policy, by the way, is to extend and expand the current tax break for first-time home buyers that is set to expire at the end of the year, as many in Congress are now advocating. Home buyers are already getting a huge benefit from the dramatic drop in house prices, along with the lowest mortgage rates in a generation, thanks to massive government infusions into Fannie and Freddie. For the government to go beyond those efforts and try to induce home sales that otherwise wouldn't have happened — at an estimated $75,000 a pop — would surely be cheered by home builders, real estate agents and the analysts at Goldman Sachs. But in truth it would be nothing more than a misguided attempt to reinflate another bubble. As I said yesterday, Congress seems intent on reinflating the housing bubble. Gee, I wonder why Ken Lewis announced two weeks ago that he was retiring as CEO of Bank of America? The Dow Jones Industrial Average has just hit 10,000, which is where it was a decade ago. 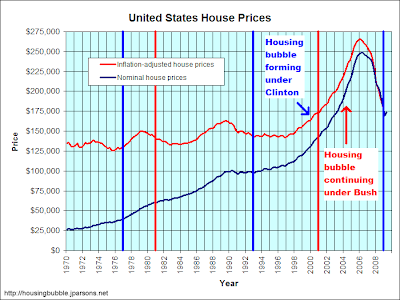 Likewise, I predict housing prices will be at roughly today's level a decade from now, although the Democratically-controlled Congress seems intent on having another housing bubble in the interim. According to a survey of professional forecasters conducted by the Philadelphia Fed, the unemployment rate is expected to remain abnormally high for at least three more years. When looking at the graph above, keep in mind that from the mid-1990s until 2007, unemployment generally ranged from 4-6%, with NAIRU (essentially the natural rate of unemployment) being about 5%. Furthermore, since 1947 there have only been three times when the unemployment rate exceeded 8%: the mid-1970s, the early 1980s, and now. What effect do you think sustained high unemployment will have on foreclosures and home prices? What effect will sustained high unemployment have on mortgage rates? What effect will those mortgage rates have on home prices? Would we have had such high unemployment if there had never been a housing bubble? Add your thoughts in to the comments. Is Bush to blame for the housing bubble? I have always been amazed at how people can be blinded by their political affiliation. Far left-wingers often go out of their way to blame Republican politicians for anything they can. Far right-wingers often do the same to Democrats. Often they will have different opinions on similar circumstances based on which party is in power. An example of this political affiliation blindness is the fact that many people on the far left insist on blaming George W. Bush for the housing bubble, while I'm unaware of any right-wingers willing to blame him. Instead, many conservative Republicans blame it on Clinton. In this graph, vertical blue bars mark when a Democratic president took office. Vertical red bars mark when a Republican president took office. Pay attention to the red housing graph line. 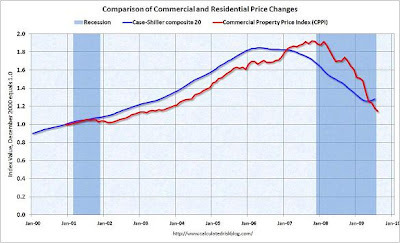 It marks inflation-adjusted housing prices. Looking at the data, I can't see how either president can be wholly responsible for the bubble. In fact, I think blaming politicians at all mostly misses the mark. So, who do I blame for the housing bubble? Alan Greenspan, who was appointed by both Republican and Democratic presidents. I don't claim that Greenspan necessarily started the bubble, but he certainly failed to do anything to stop it. Also, it was the second major asset bubble to occur during his chairmanship of the Federal Reserve. The first was the late-1990s stock market bubble. Asset bubbles are rare beasts, so having two sequentially under the same Fed chairman is unlikely to be a coincidence. The trick is to have professional regulators who actually believe in the rule of law. Bush's fox-watching-the-henhouse approach was destined for failure. Lots of people like to blame stuff like this on the opposing political party. For example, note how Republicans like to blame the housing bubble on the Community Reinvestment Act. The truth is that nobody of any political affiliation likes to step in and take away the punchbowl when everyone's partying. Just look at the failure of anyone to do anything about the stock market bubble during Bill Clinton's second term. Bubbles are caused by human nature. Since regulators are human beings, they are as susceptible as anyone else. How many home-owning regulators of any political affiliation would have wanted to rein in the rapid rise in housing prices, for example? Larger down payments would encourage home buyers to care less about monthly payments and more about overall price. They also would give home owners a bigger buffer to protect themselves when home prices fall. They would also force home buyers to have more skin in the game, so they will be less inclined to just walk away when their home price falls. All financial institutions should be required to maintain sufficient capital reserves, not just traditional banks. The required reserve ratio should automatically rise during booms and fall during busts. Countercyclical reserve policy like this would help stabilize both the financial system and the money supply. Finally, teaser rates should be outlawed. 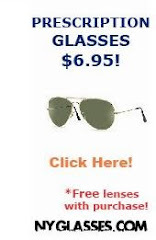 Teaser rates are intended to take advantage of people's innate susceptibility to hyperbolic discounting. If someone isn't willing to buy a home based on the regular interest rate and the regular monthly payments, then they shouldn't be buying the home. Fortune magazine asks several economists their opinions about President Obama's financial industry regulatory proposals. Overall, they're not impressed. It places naive faith in regulation. Yet regulation failed disastrously over the past decade. Bank regulators had ample powers to keep banks safe but did too little, too late. There are two areas where I think regulation is needed. The first is bank leverage. The rules are on the books and it's up to the Fed to implement them. ... The second is derivatives and there we really need to write some new regulation providing greater transparency, margins, risk sensitivity, and awareness. I think [the regulatory plan] is a major step in the right direction, but there's room for improvement. ... The regulatory plan could improve, most importantly, by providing additional clarity on how large systemic financial institutions can be safely resolved. There can also be further improvements in the price transparency of over-the-counter derivatives. I think this is doomed. ... In the U.S., discretionary regulation tends to be corrupted. I want structural separation between retail banking and casino banking, where retail money couldn't be used to finance the proprietary trading. The fundamental problem during this crisis was that when times were good no one had the political will to pull the plug. The Federal Reserve should monitor the system and then work with the functional regulator to fix problems. At the same time, we should fill the gaps in the functional regulation. Not being George W. Bush has its benefits, just ask Jimmy Carter and Al Gore. U.S. housing prices may still fall more than 10 percent, killing an incipient recovery, as demand from first-time home buyers fades, leading economist Nouriel Roubini said on Thursday. 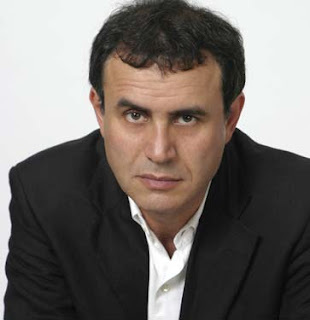 Roubini, one of the few economists who accurately predicted the magnitude of the financial crisis, said massive losses in commercial real estate loans will add to the problem, forcing banks to raise more capital. "The stress is moving from residential mortgages that are still in deep trouble, to commercial real estate, where they are just starting to recognize that they're going to have massive, massive losses," Roubini of RGE Global Monitor told reporters after a presentation for a World Economic Forum report on the global financial system. Some economists and politicians are advocating a second economic stimulus package. Here are my thoughts on a second stimulus. State governments likely have a better idea than Congress regarding what are high value spending projects within each state. On the whole, pre-existing state spending was likely already going to the highest value projects available. Since state governments are now being forced by circumstances to drastically cut back at a time when Congress's stimulus package is in effect, this suggests that Congress massively misallocated capital with the first stimulus. If Congress creates a second stimulus package, it should only consist of more aid to the states and extended unemployment benefits. Congress should avoid a bunch of bells, whistles, and pet projects. Stuff like cash for clunkers and subsidies to transfer existing homes from one person to another are just real-life examples of the broken window fallacy. Warren Buffett described the first stimulus package as a mix of Viagra and candy. Aid to the states and extended unemployment benefits would be pure Viagra. Most other spending options would be candy. Tuesday’s numbers showing that apartment rents still remain soft nationally is good news for renters and would-be renters. Those figures show that the apartment vacancy rate is still climbing, and reaching near record-highs since research firm Reis began its count in 1980. Renters can drive a strong bargain in the current climate. Our policies should encourage people to live in housing they can afford, not to borrow as much as possible. If the question made it into the book, you can probably guess what the answer is. Update: It appears there may be problems with the book's global cooling chapter. But the world needs to nourish its bears. They were right about most things in the past ten years: dotcoms and American houses were indeed overvalued, and rapid credit growth did make America’s financial system and the global economy vulnerable. ... This decade, investors have lost more money listening to the bulls than to the bears. Don't buy gold. The dividend yield is too low.